Inflation a Problem? Just Change the Way You Measure It! Trying to explain away the steep rises in theCPI, Tharman has pointed out that they are mainly due to rises inCOEcosts and market rents which do not affect the majority of Singaporeans. Rents for public housing may have outpaced house prices over the past year. However this barely begins to correct the divergence between house prices and rents over the last twenty years. The HDB resale price index has increased some 340% over the last twenty years while the CPI, of which housing costs represent 25%, has only risen 40%. If one took Tharman’s arbitrary choice of methodology to its logical conclusion then theCPIhas seriously understated inflation over the last twenty years. If this is true then median real incomes are much lower than the government has claimed and may in fact have fallen over much of this period. By these words Tharman merely demonstrated how out of touch Ministers, with their multi-million dollar pay packages, are with the problems of ordinary Singaporeans. His comment that Singaporeans who are not buying a new car will not be affected is uncomfortably reminiscent ofMarieAntoinettewho, when told that the peasants could no longer afford bread, is reputed to have asked why they could not eat cake instead. It is rather like a multimillionaire saying how fortunate poor people are because they are not faced with the high cost of fuel for their private jets or air-conditioning bills for their mansions. Or theCEOof a large company saying that he understands what the workers he has to fire are going through. But then again why should I be surprised? 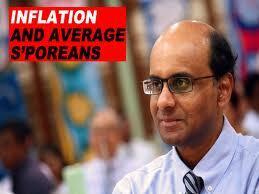 Tharman is of course a multi-millionaire and so are all his Cabinet colleagues! His statement makes no economic or logical sense either for the minority of Singaporeans who are already car owners. What difference does it make if they are not buying a car this year? Is Tharman really saying that price increases this year, assuming they are not reversed, will not affect car buyers in future years? We have had rapid economic growth fuelled by generous tax breaks for foreign investment and cheap foreign labour from abroad without any rise in underlying productivity and a 25% rise in population over the last ten years. This has pushed up property prices and rents and undoubtedly been a big contributor to domestic inflation. However the CPI fails to reflect this in full because it uses what is called an imputed rent for owner-occupied housing instead of an index of mortgage servicing costs plus depreciation. Thus the CPI for housing only rose by 5.3% between January 2010 and January 2011 while the HDB resale price index was up by 14% between the fourth quarter of 2010 and the fourth quarter of 2009. So we are getting in all likelihood a serious understatement of the true inflation rate and an even more serious erosion of the purchasing power of Singaporean workers. Certainly we can see this effect in the CPI index. The HDB resale price index has risen some 340% in the last twenty years while median nominal household income has risen by only just over 100%.Even though The Department of Statistics uses an archaic method of calculating housing costs the effects are still apparent. Despite the enormous rise in house prices the rise in owner-equivalent rents as calculated by the Department of Statistics has been much smaller. If we had used an index of mortgage servicing costs plus depreciation, as is used in theUK, in calculating the housing component of theCPIthen it is likely that theCPIrise over this period of some 40% would have been significantly higher. This in turn would have negatively impacted any government claims of a rise in the real median incomes of Singaporeans. There are several reasons why one would use a measure of imputed rent. TheCPIis only concerned with the cost of consuming a basket of goods and services necessary to maintain your standard of living. Therefore for housing owners any calculation of the cost of housing must try and isolate the consumption of housing services from investment gains or losses through holding housing assets. Using an estimate of how much it would cost to rent an equivalent property is one method of doing this. TheUScurrently uses this method but in the housing bubble there was a huge divergence between rents and housing prices and the ratio of house prices to rents rose as much as 40% up to 2006. It has since fallen back with the property price crash but this correction has not yet occurred inSingapore. InSingaporethere has been a similar credit-driven expansion in the ratio coupled with some uniquely Singaporean factors such as the government’s monopoly on supply. The small size of the HDB rental market relative to owner-occupiers is another factor that might lead one to suspect any estimates of housing costs derived from imputed rents. It undoubtedly does not help that the Statistics Department is not independent of the government and that it exhibits limited openness and transparency about how its methods. As an example of best practice, the Bureau of Labor Statistics in theUSinvites public comment before it changes its methods of calculation. Our Department of Statistics should do likewise. Finally Tharman is as usual only telling half the story when he says that the majority of Singaporeans own their own homes. 85% of Singaporeans may live in public housing which is on 99 year leaseholds but this is more a reflection of how the government has constrained demand by monopolizing supply. A significant proportion of the 85% will include people such as young Singaporean adults who have to live with their parents. They cannot afford to move out because prices have soared to unaffordable levels. For this group it is not simply not true to say that increases in housing costs whether in the form of prices or rents will not matter. Since HDB apartments are only on 99 year leasehold it is surely not correct to treat it in the same way as freehold housing is treated. I am not aware of any explicit promise from the PAP that HDB apartments will be upgraded and the leases restarted though Singaporeans have come to expect it (and the PAP have used the threat of withholding upgrading to win elections, most notably at Cheng San in 1997). Therefore if the Statistics Department were being properly rigorous they would include amortization in their calculation of housing costs. This would have made housing inflation in theCPIconsiderably higher and real income gains much lower. Not You Too Foo! Pinjam also can! Reminds me of Vivian Balakrishan: Do you want three meals in a hawker centre, food court or restaurant? Another govt bull-shitting; to put it in a nutshell.